At the main press centre, a wave of applause rang throughout the cavernous room when Kim Jong-Un approached Moon Jae-In for a handshake. 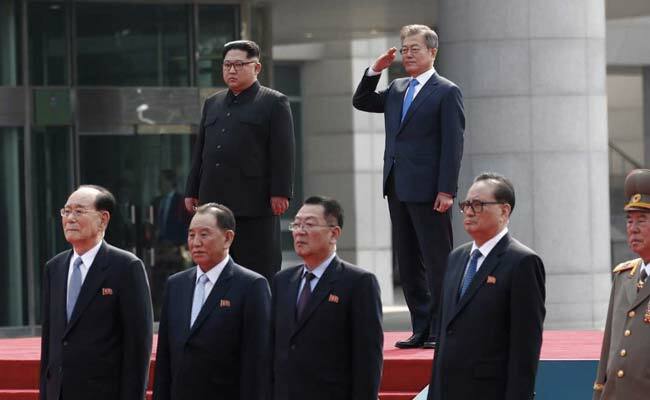 Seoul, South Korea: As the leaders of North and South Korea clasped hands over the Military Demarcation Line, South Koreans were glued to the screen to watch history being made -- even from prison. 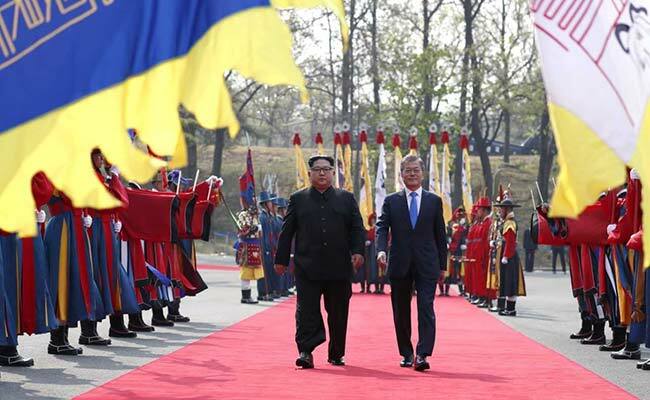 The summit, the first in more than a decade between two countries technically still at war, received wall-to-wall coverage on nearly every television channel and many South Koreans tuned in. Even convicts across the nation saw their usual diet of pre-edited TV interrupted for "emergency live programming" of the landmark handshake between Kim Jong Un and Moon Jae-in, the South Korean justice ministry said in a statement. "We allowed all inmates detained in detention centres across the country to join the nation for the historic moment of the South-North summit," added the ministry. Lee Song-eun, an elementary school teacher in Seoul, usually ensures the television in her classroom is turned off, but made a rare exception. "Even if I get complaints that I'm not teaching to watch this, I am so curious," she said. "The kids were working on their assignments and suddenly broke out into 'Ah!' and 'Oh!' when Kim Jong Un appeared," she told AFP. Worker Kim Eun-jin, 31, said her whole office gathered around the TV to watch the summit pageantry play out on television. "My colleague was so touched, he cried," she said. The summit dominated online as well, with "Kim Jong Un" the most searched term on Naver, South Korea's largest portal. Phrases like "Pyongyang naengmyeon" -- a North Korean cold noodle dish -- and "Military Demarcation Line" were trending on South Korean Twitter. In contrast, on the other side of the border, North Korean state television -- there is no other kind -- showed a test card all morning, with the first news bulletin in the afternoon merely reading out a dispatch from the official KCNA news agency saying Kim had set off for Panmunjom to meet Moon. At the main press centre, where around 3,000 journalists have gathered, a wave of applause rang throughout the cavernous room when Kim approached Moon for a handshake. Like Moon in the summit room, journalists from the South roared with laughter when the North's leader joked about how he had brought Pyongyang naengmyeon for the dinner banquet. "I hope that the president will be able to enjoy the Pyongyang naengmyeon that has travelled far," Kim said, before laughing and adding, "I shouldn't say far." Pyongyang naengmyeon -- already a popular summer delicacy in the South -- appeared to be selling like hotcakes at lunch time. Thousands of South Koreans posted photos of the cold buckwheat noodle they slurped down for lunch on Instagram with hashtags including #summit and #peacenaengmyeon. "Eating a bowl of naengmyeon hoping for peace," said one user. The sudden high demand meant that some were turned away disappointed. Office worker Lee Su-hyeon told AFP that 100 people were ahead of her in the line. "I really wanted to eat naengmyeon today. I'm so sad," Lee said. 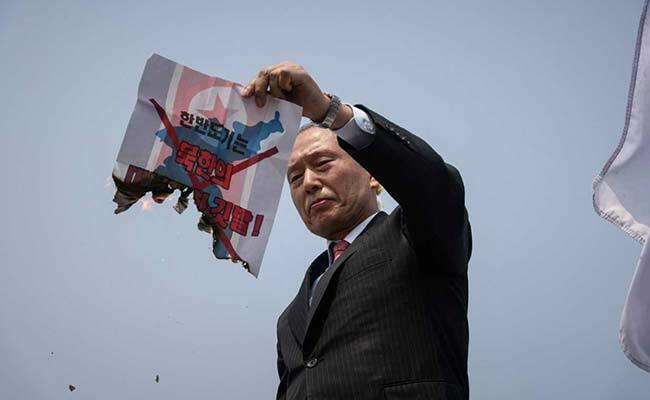 But not all was euphoria and optimism, with some protesters burning a North Korean flag near a checkpoint leading to the Demilitarized Zone where the summit was taking place. One commenter on Naver said the summit was positive, "but we can't have blind faith", blaming Kim for the assassination of his half-brother Kim Jong Nam in Malaysia last year. "We believed them during the 2000 summit and were hit in the head. We have to be open all possibilities. We have to be wary because he is the guy who killed his brother."